This secure system ensures cards are always in the correct place, eliminating loss or misuse. The clear acrylic window allows cards to always be in view, while also securely enclosed. Cabinets are constructed of Anodized Aluminum with a full-length piano hinge door and a traditional frame. 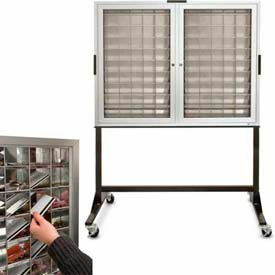 Cabinets can be wall-mounted or mounted in a solid-steel frame stand with 3" swivel casters. 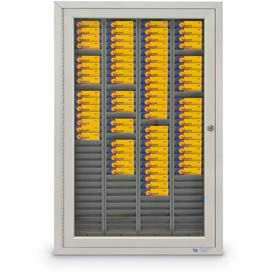 Choose from single door cabinets with either 60 or 120 badge slots or a double door design with 240 badge slots. Key & Credit Card Cabinets Are Lightweight With A Space-Maximizing Design. Key & Credit Card Cabinets offer storage space for up to 70 or 140 keys, ID badges or credit cards. Anodized Aluminum construction and acrylic window provide long lasting durability as well as easy wall hanging. Each locking cabinet includes two keys. 3" x 3" x 2" deep slanted pickets. 1" wide main frame with 1-1/2" door frame. Heavy duty steel tube stand with powder coated finish. Choose from a standard wall hanging design or a stand-mounted design with 3" swivel casters for added mobility. Stands ship knocked down.